Plug and cartridge fuses come in many shapes and sizes. There are the older screw in fuses that were a menace, simply because you could screw a 20 or 30-amp fuse into a 15-amp socket. The newer style is an Edison-based socket that only allows you to screw the appropriate sized fuse in the socket in order to make the connection. The man fuses and fuses rated over 30 amps will require cartridge fuse. These vary in physical size and are cylindrical in shape. One type of fuse, the plug type, are of the smaller variety of fuses that handle the protection of circuit loads. These usually come in values of 15-, 20, and 30-amp fuses. The older of these fuses featured the exact same sized screw in fuse size for all of the fuses. This is particularly troubling for me as a safety-oriented guy. You see, that means that you can take a 15-amp fuse out of the socket and screw in a 20- or 30-amp fuse in that same socket. 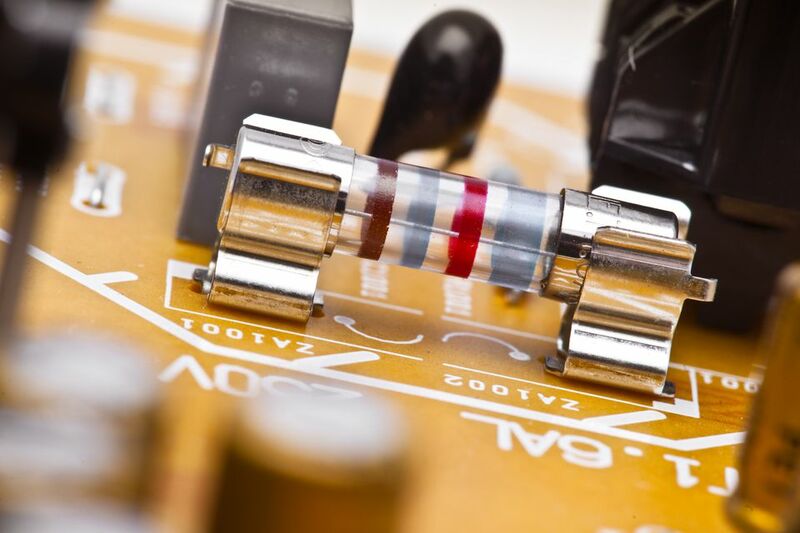 For this reason, you can turn a 15-amp circuit into a 20 or 30 amp circuit by just changing the fuse. The problem is that the wiring may only be rated for 15 amps. Now, with the addition of the over-sized fuse, you have potentially crated a potential electrical fire in the works. To stop people from doing just that, the electrical industry developed a new method, the Edison based fuse holder and fuses. These fuse holders are designed with different depths for different amperage-rated fuses. That way, you could only screw a 15-amp fuse into a 15-amp fuse holder, that is if you want it to work. The 20- and 30-amp fuses will not make contact with the inner base if screwed into the socket of the 15-amp socket. This is also true of each of the others. I was actually in the electrical supply house one day when a farmer came in and asked if they had a bigger fuse than the 15-amp fuse. The attendant told him he had a 20-amp fuse and the farmer promptly took it. I cringed at the thought, but a few minutes later, the farmer returned and said that that fuse was too small too because it blew also. he then wanted to know if they had yet a larger fuse and they said yes, we have a 30-amp fuse. Of course he wanted it and at that point I could take no more. I told the attendant he should just give him a penny to put in the holder. The farmer asked me if that would work. I told him that if he puts anything besides the right sized fuse in the holder, he might as well call 911 right now. He asked me why and I told him he would likely have an electrical fire with the things he was doing. I explained he needed to call an electrician because the fuse was doing its job. Plug fuses come in a screw-type configuration. They come with a sight glass that shows if the fuse is blown or not. The older type fuses have a brass screw thread on the side and a center contact point. The newer style, Edison-based, have a plastic thread with a spring-type contact and a center contact. The Edison-type base has an advantage over the older style. It only allows the appropriate sized fuse to be installed, unlike the old style that you could actually install a 30-amp fuse in a 15-amp socket. When a plug fuse blows and you need to find out if in fact it is bad, testing plug fuses with a multi-meter is the way to go. What are Screw-in Plug Fuses, Tamper-proof Fuses, and Fuse Adapters? Learn what plug fuses, tamper-proof fuses, and fuse adapters are and what they look like. Cartridge fuses are cylindrical in shape and have the contact points at either end. These fuses are used in fuse panels and disconnects for amperages over 30 amps. What is a Cartridge Fuse? Learn what a cartridge fuse is and what applications they are suitable for. Learn how to test cartridge fuses to find out if they are blown. Fuses, however, may look similar, but the new style, Edison-based, only allows you to screw the appropriate sized fuse into the socket. This safety feature stops people from taking out a small fuse, like a 15-amp fuse, and replacing it with a 20- or 30-amp fuse. As you can see, placing a larger valued fuse on a circuit with lower rated wiring is a disaster in the making. What is worse, I have seen the farmers replace the fuse in the socket with a penny under it to short the connection across, basically having no protection at this point. Like I told the man who said he did this, "Call the fire department now! You're going to need them." Standard sizes include, 15-, 20- and 30-amp fuses in the screw-in variety. These type of fuses screw into a socket, shaped very much like a light bulb socket. 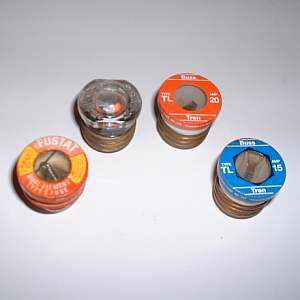 Edison based fuses (labeled with an "S", have a smaller screw-in base and it is called a rejection base. This means that only the right sized fuse can be replaced in this type of base. For instance, a 30-amp fuse will not make contact in a 20-amp Edison base, therefore it is fool proof. This is a great added safety measure to eliminate someone just putting an over-sized fuse into a fuse socket to try and keep the fuse fro blowing. The real answer is to eliminate some of the load on the circuit instead until the fuses no longer blow. Here's a good look at service panels, distribution, circuit breakers and fuses in your home. See how the power flows in to your home from the utility company's connection point to the panels in your home, to the devices that you plug things in to. How well do you know your power grid in your home? How Much Electricity Do I Need for My Home?